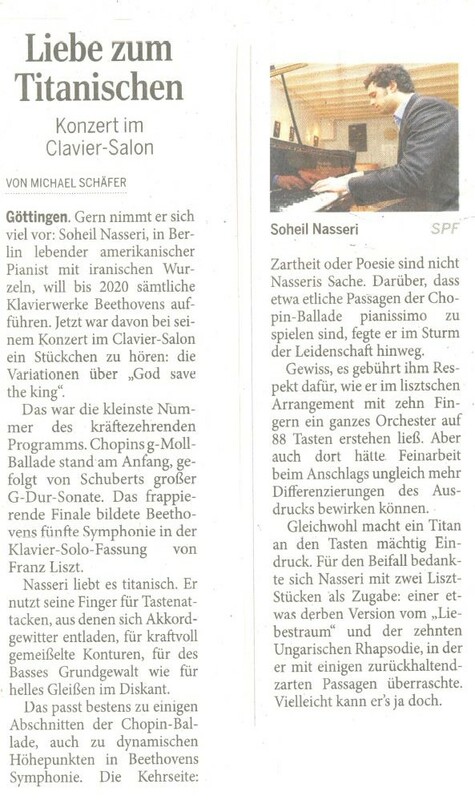 note from Soheil Nasseri: the 1898 Steinweg piano used for this concert did not function properly when played softly: many notes would not sound at all. The only practical solution was to play loudly. It was the shortest number of an otherwise truly exhausting program. Chopin’s G-minor Ballade at the beginning followed by Schubert’s big G-major Sonata. The astonishing finale constituted Beethoven’s Fifth Symphony in the solo piano version by Franz Liszt. Soheil Nasseri loves it titanic: he uses his powerful fingers for keyboard attacks that release thunderstorms of chords and chisel strong contours, for the underlying power of the bass and gleaming upper register. This is very well-suited to several sections of the Chopin Ballade as well as the dynamic peaks of Beethoven’s Symphony. The other side of this titanic attitude: tenderness or poetry are not necessarily Mr. Nasseri’s thing. Many passages of the Chopin Ballade should be played pianissimo but these were swept away in the storm of passion. Apparently he thinks the amazing little modulations in the Schubert Sonata are obvious and played them straight though. If only he had paused for just a tiny moment, taken down the level of sound and created a secretive color, he could have revealed Schubert’s magic. Certainly he impressively demonstrated the improvisatory gestures of Beethoven’s Variations. And he deserves great respect for recreating an entire orchestra with only 10 fingers and 88 keys. But even there he could have produced much more differentiation in the quality of sound. Nevertheless, a titan makes a mighty impression at the keyboard. Mr. Nasseri thanked the audience for the applause with two pieces by Liszt: a somewhat gruff version of Liszt’s “Liebestraum” and the 10th Hungarian Rhapsody in which he surprised with several restrained and tender passages. Maybe he can do it after all.